Tara House Bed and Breakfast situated in Salthill is in the perfect location, just 200 metres from promenade and famous Galway Bay. It is close to golf clubs, fishing, tennis, leisure land and Pearse G.A.A Stadium. Bus stop to City Centre is directly outside main entrance. This family owned Bed & Breakfast with private car park is the ideal base for touring Aran Islands, Connemara, Cliffs of Moher and the Burren. Our generously sized en-suite rooms have multi-channel T.V, direct-dial telephones, wifi internet access, hairdryer, ironing, tea and coffee making facilities. Ground floor accommodation available. 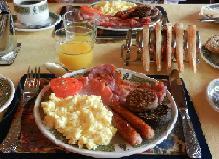 Indulge in our delicious Full Irish breakfast served with Tea or Coffee. We also serve a wide range of cereals and fruits.